As the longest government shutdown in US history toils on, meteorologists and forestry experts fear they've lost crucial time to get ready for next year’s natural disasters. Without these preparations, the US risks greater infrastructure and economic damage down the line. The US isn’t in wildfire or hurricane season yet, but the early months of the year provide some of the best moments for officials to prepare for the upcoming season. However, employees at the US Forest Service, the Bureau of Land Management and even NOAA have been furloughed, so they can’t share research, take readings or even make official plans for what to do after the shutdown. This could create problems in places like California, where the shutdown has stalled the prescribed burns and forest-thinning efforts that reduce the risk of wildfires. Intentional fires can only be set in winter, when the temperature and humidity can help control their progress. But more than half of California’s forests are federally owned, and without approval from the agencies the Bureau of Land Management, not even contracted workers are allowed to clear this brush. On the Atlantic coast, NOAA and its subsidiaries have suspended research and development for the next hurricane season. 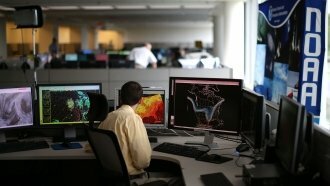 This includes pausing an upgrade to the Global Forecast System, which is a critical modeling tool that helps forecast where storms will go and how strong they'll get. If the shutdown continues, NOAA officials say the improved system may not be ready until next year. The shutdown has also stopped efforts to evaluate and fix infrastructure that was damaged in earlier disasters. The furloughs have slowed fire clean-up in places like Redding, California. The Carr Fire burned 229,000 acres there in 2018. FEMA has also ordered its contractors to halt disaster planning work like flood mapping until the government reopens.